Guga S’Thebe is a cultural centre which was founded in Langa, the oldest township in Cape Town, after the end of apartheid in the 1990s. It attracts both children, young people and artists from the neighbourhood and large numbers of tourists from all over the world. 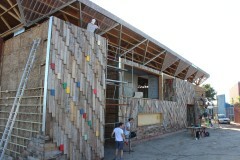 For the residents of Langa, Guga S’Thebe also offers a unique opportunity to experience art, culture, and international dialogue. Over the years, the work with children and young people who are taught by local teachers and artists has become a focus of the cultural centre. Guga S’Thebe has become a place which offers a space for shared learning, making music, creativity, care, food, and education outside of schools and away from what are often difficult family circumstances. The cultural centre, which is truly one of its kind, has now ran out of space. A new multi-purpose room for music, dance and theatre, a library, and areas for workshops, are all urgently needed. 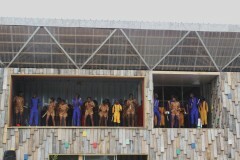 The new building will facilitate the continuation and expansion of the successful work with children begun in Guga S’Thebe in a range of different music, art, and dance workshops, as well as public concerts. 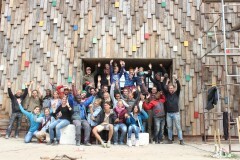 Under the leadership of South African architect Carin Smuts, students of the department of architecture from the universities PBSA Dusseldorf, RWTH Aachen, and GaTech Atlanta are designing, planning, and building the youth centre. Since July, practical work has also been taking place in Cape Town. The project, which can name one of its founders as the AIT ArchitekturSalon, is one of the prize winners of the 2013 Summer School Competition run by the Sto Foundation. As Cape Town will be World Design Capital in 2014, the planning and construction phase with international students, local artists, and the Langas community can become part of the process. The aim is to create an innovative building via participation, social integration, and the implementation of reusable and recyclable materials. In workshops with children and young people, rooms and spaces can be designed with which their 'designers' will later identify and where they can feel safe and secure. A project blog will report on the progress of the construction works.